Pokster, free poker stats tool. Mac / Linux supported Flash version. No action at 5 Card Stud tables. Offering tremendous player traffic, competitive online poker promotions, and a vast array of daily and weekly poker tournaments, Poker770 is an online poker room with much to offer. Whether an experience veteran player, or a complete novice, Poker 770 caters to the needs of every type of online poker player. For beginners and less-skilled players, Poker770 provides a free poker software utility players may use to track their hands, and analyze their statistics to improve their poker strategy. Poker770 also provides numerous daily beginner tournaments with ultra-low buy-ins, allowing players to practice their tournament strategy with minimal risk. Veteran players will enjoy huge guaranteed prize tournaments, live event packages, and the multi-tabling capabilities of the Poker770 software. A 200% welcome bonus of up to $2000 will help players of all types get the ball rolling at Poker770, with plenty of freerolls to further pad the bankroll. Utilizing the Playtech software licensed by the iPoker Network, Poker770 provides a stable, feature-rich online poker experience that may be downloaded directly to the PC. For those who cannot download the Poker770 software, an instant-play flash version may be accessed via most operating systems with Adobe Flash Player-enabled browsers. Lobby filters help players to quickly find the types of online poker games they are seeking, and hand histories allow players to review their hands without leaving the table. 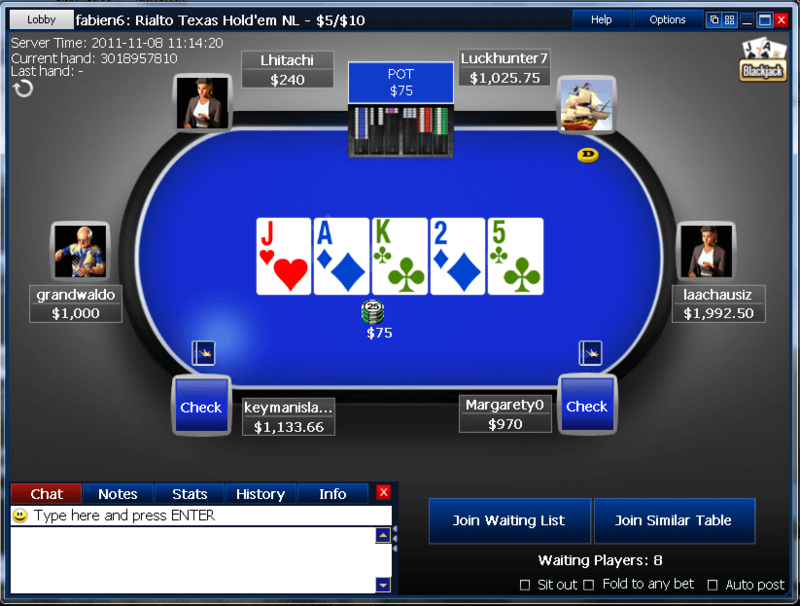 Multi-tabling is supported on up to 16 tables at once, with scalable graphics, and just one-click to cascade or tile all open windows. Live chat support is also built into the online poker client for rapid assistance from Poker770 customer service representatives. Situated on one of the largest online poker networks in the industry, Poker 770 shares in a massive player pool that keeps that action going 24/7. Thousands of players populate the No Limit Texas Hold’em cash games at all hours, and Pot Limit Omaha draws hundreds more. Significant traffic can also be found at Fixed Limit Hold’em, Pot Limit Omaha Hi/Lo and 7 Card Stud; even in off-peak hours. Players looking for 5 Card Stud games, however, will have some difficulty finding interested opponents. Poker770 offers an extensive online poker tournament schedule to fit the needs of every type of poker player. STT specialists will enjoy the $100K progressive jackpot Sit and Gos, while MTT players can compete for a chunk of the weekly $200K Sunday Guaranteed. Beginner tournament players can get in some much needed practice at the daily Start and Roll tournaments held every two hours, with buy-ins as low as $0.35. The nightly $500 Guaranteed Deepstack Party allows tournament players to start with 10,000 chips for their $10+$1 buy-in, or satellite into the tournament via DeepStack Party Sit and Gos for as little as $0.22+$0.02. Every Monday is Pot Limit Omaha night at Poker770, and players will also find regular opportunities to score seats to major live events. Offering the standard selection of online poker game forms – Texas Hold’em, Omaha, Omaha Hi-Lo and 7 Card Stud – Poker 770 also features 5 Card Stud. However, the 5 Card Stud tables are often vacant. The traffic across the iPoker network is a mix of new and experienced players. The softest competition can be found at the lowest stakes, where players are more comfortable with paying to see the flop despite a weak starting hand. However, as the monetary risk rises, so too does the relative skill level of the Poker770 traffic. New players at Poker770 may claim an extraordinary 200% welcome bonus of up to $2000 when they input the Poker770 coupon code free2000 at sign up. Eligible players will also receive free entry into three of Poker770’s daily freeroll tournaments. Once a player has qualified for the 200% first-deposit match from Poker770, they may begin playing the real money online poker games, and earning the Points770 required to release the pending bonus. For every 150 Points players accumulate playing raked cash games and tournaments with an entry fee, $2 of the Poker770 bonus will be issued into their real money account. Players will have 45 days to clear the entire Poker770 sign up bonus. The Poker770 VIP Club offers loyalty rewards to real money online poker players of all levels and abilities. Players who earn at least 20 Points per month will receive tickets to three daily freerolls at Poker770, and a 25% point boost. At the bronze level (750 points + 150% boost) players become eligible for cash bonuses, and even more freerolls. The points players acquire in real money online poker games may also be spent on merchandise from the Poker770 VIP Shop. From live event qualifiers to bounties on Poker770 Pros, this online poker room runs an excellent assortment of online poker promotions to encourage online poker players to make the jump to Poker770. Discounted tournament fees, team championship tournaments, and the opportunity to face off against one the Poker770 pros in a $200 heads up Sit and Go, just scratch the surface. Friend referrals can earn Poker770 players up to $75, and becoming a fan of Poker770 on Facebook automatically enters players into a drawing to win as much as $10,000 from Poker770. Players are also urged to improve their online poker results to the pro-level by downloading and utilizing Poker770’s free poker statistics tool, Pokster. Players may contact the customer support team at Poker770 24/7 with any issues they may encounter. A live chat support feature is included within the software for the utmost convenience. Support may also be contacted via telephone, fax, or email. 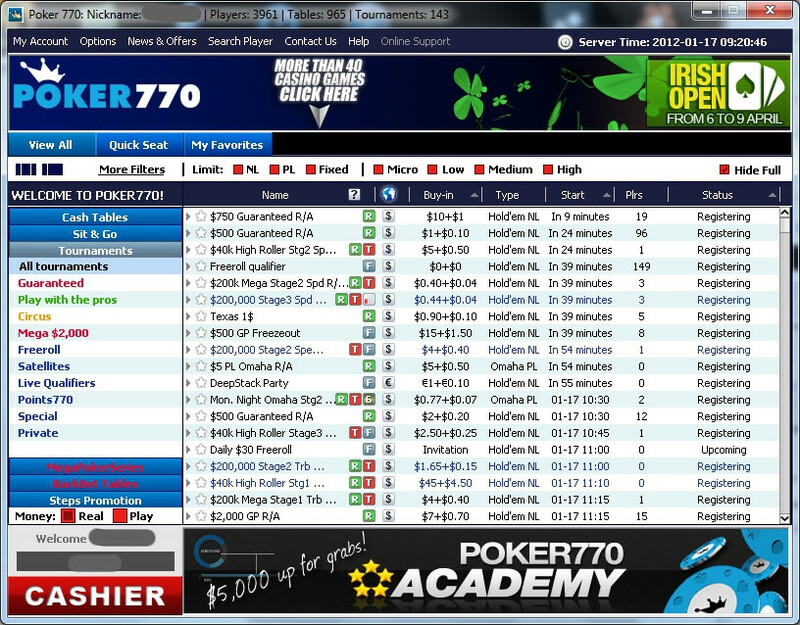 Poker770 provides an extensive FAQ on their website, and a Help section within the software. Deposits: Visa, MasterCard, Delta, Visa Electron, Click and Buy, Moneybookers, NETeller, Click2Pay, Ukash, Paysafecard and Entropay. Cashouts: NETeller, Moneybookers, Click2Pay and bank transfer.